newprotest.org: FOUR LEGS. TWO BUTTS. Back in January, I discovered the one-eyed cat. Delicious. Full text from the article. The Te Uku-bred Barnevelder chick - hatched at Marlene Dickey's property at the start of last month - has died. While she was surprised by Forzie's death - he weighed a "good pound of butter" and was gaining feathers slowly - it was not totally unexpected, she said. And it was fun while it lasted. "He was a bit of a laugh." 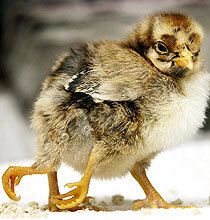 Looking ungainly on its extra legs but twice as cute, the bird was an exception to the rule that chickens with defects are not normally born alive. He was found dead on Friday and is now in the Dickeys' freezer waiting to be stuffed. After he's been to the taxidermist, the family plan to donate the bird to Auckland Museum. I used to work in a hatchery of one of Australias leading poultry producers. In a batch of 50k new hatched chickens at least 300 of them had deformities like this. Two heads, extra wings growing out their backs, 3 and 4 legs, no legs, one eye, two beaks were something we saw daily. I always wanted to smuggle them home and have a back yard full of f--k ups. Company policy though meant they went through the woodchipper instead. I wonder if Australian poultry farms are particularly prone to deformation (hormones, chemicals, radiation? ), or if this is something that occurs naturally among chickens. COMMENTS for FOUR LEGS. TWO BUTTS.